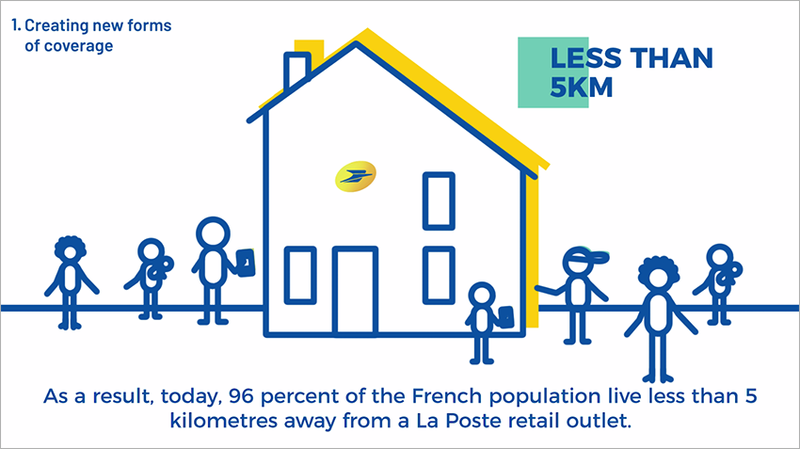 Le Groupe La Poste consists of 17,000 public outlets spread across the whole of France, 75,000 postmen and women working six days a week delivering to French homes, and an ever-widening diversity of services. This coverage, its local service and the public trust built up over its long history all give La Poste a role in France’s social and regional cohesion, and make it a vital link in regional planning. [VIDEO] Le Groupe La Poste contributes to fostering social interactions by optimising its presence and services and by engaging with local stakeholders. Thanks to our engagement with local stakeholders, we are able to identify and anticipate emerging requirements and we experiment with new ways of meeting them. By proposing new services and innovative ways of being present, we are consolidating our role as a trusted provider, present and useful everywhere, for everyone, each and every day. Through our daily actions and the public service mission in regional planning that the French government has entrusted to us, the entire Group contributes to reducing disparities between regions. In practical terms, 96% of French people live less than 5 kilometres or a 20 minute-drive from one of the group’s outlets. But local service provision is not merely a matter of distance, which is why we have developed new ways of being present to adapt to the variety of needs and situations that arise, with actual post offices, counters in other outlets, community and inter-community offices, the new role of combined postmen-counter staff, etc. Closely linked to e-commerce, parcel delivery is also a key aspect to modern life. We are increasing the number of delivery options by considerably expanding availability timeslots. For example, 90% of our Pickup points are open on Saturdays, and 50% on Sundays. Our Pickup lockers can be used to collect parcels at any time, another feature making customers’ lives easier. This same philosophy led us to get involved in developing more than 500 of the 1,000 public service bureaux (the “maisons de services au public”) the French government planned to establish. Found throughout the country, in more rural locations, these bureaux allow French people to complete various administrative procedures with partner operators, with appropriate support and advice on offer. Open to all, they combine face-to-face contact with online systems to provide access to a full range of public services. Cities, mid-sized towns, suburbs, market towns, villages... the common distinction between town and country covers a vast range of realities. They need different services, to match constantly changing ways of living and working. French society must also deal with new family structures, far greater mobility over the course of a lifetime, and greater longevity for the population in general. All these changes are causing new classes of vulnerability and new requirements for services. There are now more than 4 million people aged over 60 who live alone. We have launched a whole range of local services to offer support and guidance to our senior citizens, such as the “keep an eye on my parents” service from La Poste, which offers regular home visits and phone assistance round the clock, the Ardoiz tablet, and home delivery of shopping, medicinal products or meals. A diverse range services for the elderly enabling as many as possible of them to continue to live at home. Solutions to allow seniors to stay at home... and young people to go out! Le Groupe La Poste endeavours to offer universal services, so we know that young people too face some specific difficulties. In rural areas in particular, where access to the highway code theory test was previously something of an ordeal in terms of time taken to register, remoteness from test centres, etc., we now offer would-be drivers the option of registering on our special website to take the driving theory test at one of 550 post office sites equipped for the purpose. It takes under 48 hours and is affordably priced. Thus far, more than a million people have used this new service. Local economies are a crucial component in a region’s health and well-being, and are often a source of highly beneficial innovations in response to local needs. To encourage this process, we work with stakeholders in the social and solidarity economy, including through the “dynamic alliance”, which is a partnership agreement between La Poste and some fifty national partner networks and a large number of local non-profit organisations. It aims to develop innovative responses to the needs of local areas and people. For example, 2017 saw La Poste and the non-profit organisation Rejoué working together, with the result that 43 tonnes of toys were repaired and given a fresh lease of life, while simultaneously helping employ people previously excluded from the job market. Its procurement policies mean Le Groupe La Poste supports 100,000 local jobs across France. In 2017, €26m of procurement was in the “responsible” category, aimed at helping businesses employing persons with disabilities or running workplace inclusion schemes. As the same time, we encourage our SME suppliers to incorporate social responsibility into their businesses. This encouragement includes the insertion of CSR criteria into our tenders with the aim of helping SMEs to adopt a socially responsible stance. It provides an additional lever enabling us, in our own way, to awaken a collective consciousness by involving our partners in our own CSR. As a responsible bank, Banque Postale is also involved in the entire Group’s effort. The bank has become a leading name in the financing of local public-sector facilities (hospitals, gyms, social housing, etc.). It committed very early to financial products accredited as socially responsible investments. Currently, 50% of outstanding amounts managed by our bank use such products, and 100% will be doing so by 2020. The Group’s objective is to simplify everyone’s life by providing access to the same services for all, wherever in France they might be.